There is nothing like fluffy and tender pancakes. Part of my education as a registered dietitian is food science. I use that knowledge here tell you how to make the best possible pancake with a pancake mix. Or use your favorite homemade pancake recipe. 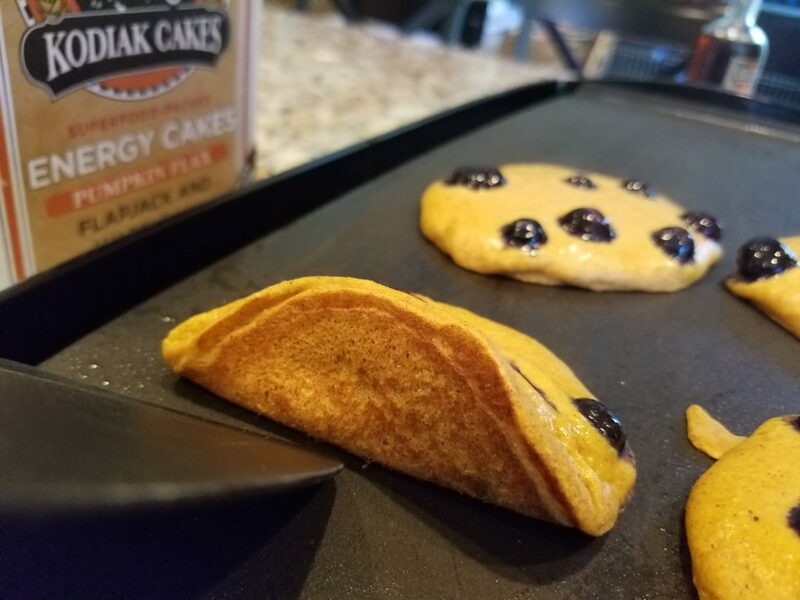 For nutritious pancakes, use Kodiak Cakes Flapjack and Waffle mix. These are whole grain and higher in protein than most mixes. To order online use the code Faires10 for a 10% discount. 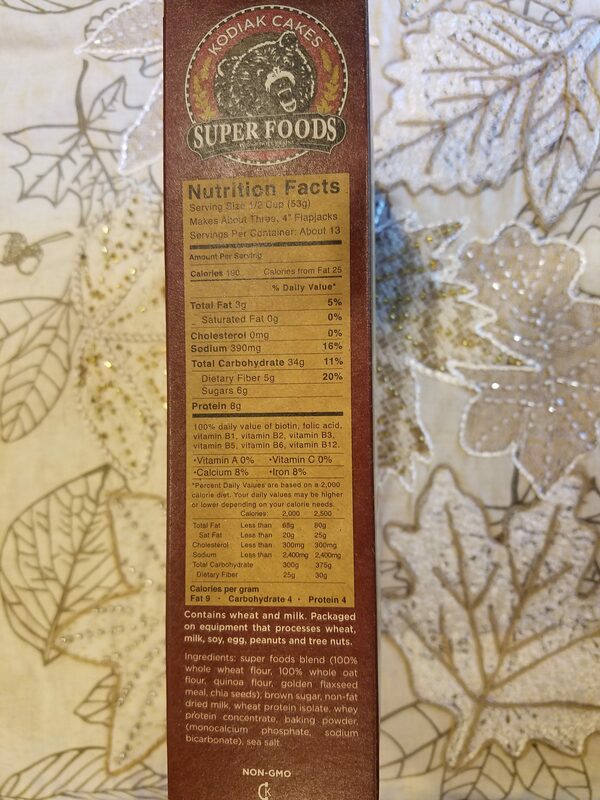 The other pancake mix I like is Bob’s Red Mill linked here. Make the batter but be careful not to overmix. If you overmix you will have tough and chewy pancakes instead of the light and fluffy ones you were dreaming about. Next, let the batter rest 5 to 15 minutes. This will result in pancakes that are more tender. Use this time to clean up, set the table, and prep the other parts of your breakfast. I suggest using an electric griddle set at 375 degrees so that you can control the temperature. Let it heat up a couple minutes. Then grease the the griddle lightly. Turn the temp down to 360 to 370 once you start to cook the pancakes. Poached eggs are a nice accompaniment to pancakes. I have and love this poached egg maker pictured below. And for other breakfast ideas go to my post here. Test the temperature of the griddle by making a tiny pancake and adjust the temperature accordingly. Not hot enough means slow cooking which makes tough pancakes and too hot and it burns. Ladle the batter onto the heated griddle. Use a 1/4 cup measuring cup to make perfect sized pancakes that are evenly sized. Sprinkle frozen blueberries on top of each raw pancake. No need to thaw the berries before cooking. 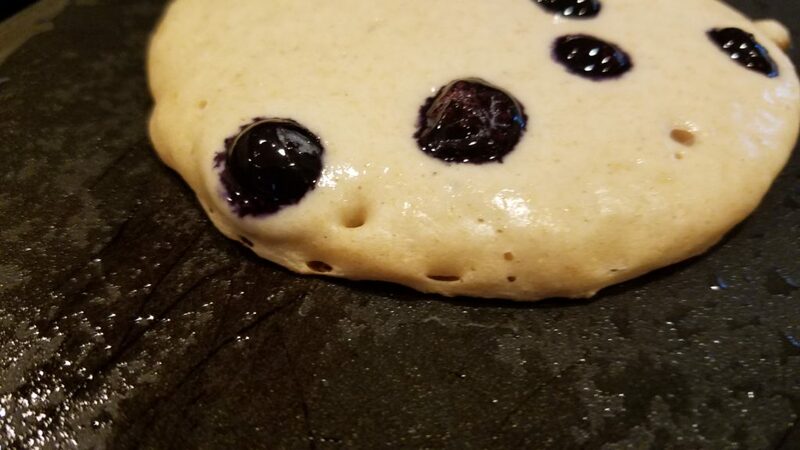 The contact of the frozen blueberries on the heated griddle will thaw the blueberries. 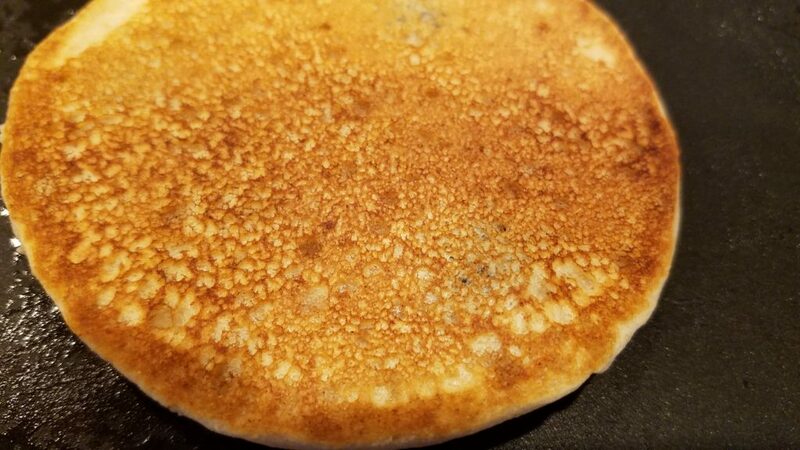 If you put the blueberries into the raw batter and mix you will have overmixed and deflated pancakes. Cook for 2 to 3 minutes on medium-high. You’ll know when to flip them when the edges are dry and bubbles have formed and popped around the edges. You can use a spatula to check if they are nicely browned on the bottom. If the pancakes are too floppy to flip, they aren’t cooked enough. If they are getting brown before they’re ready to flip, turn down the heat. Perfect edges, dry and bubbles have formed. Don’t flip too soon. And only flip once or you will deflate the bubbles. Don’t press down on the pancakes while they’re cooking or that will result in a flat pancakes. Continue to cook until done. Place pancakes on the warmed plate. Top with fresh blueberries or some thawed frozen blueberries. To enhance the flavor of your blueberry pancakes use blueberry syrup. 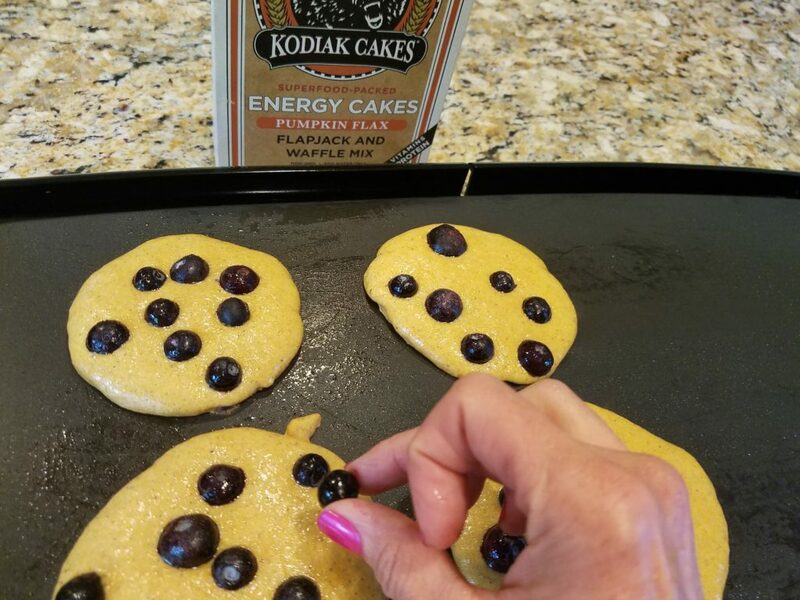 This entry was posted in Grains, Recipe and tagged breakfast menu, Kodiak Cakes by Maria Faires. Bookmark the permalink.